New Skoda Octavia Estate for summer 2013 | What Car? 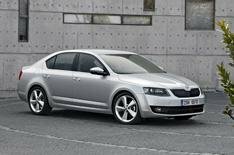 The 2013 Skoda Octavia Estate will go on sale next summer, shortly after the launch of the all-new hatchback, Skoda has confirmed. At an unveiling for the all-new Octavia, Skoda sources told What Car? that there won't be long to wait for the estate version, which is likely to be become one of the largest cars in its class. The new Octavia hatchback is longer and wider than the current car and has a load capacity of 580 litres with the rear seats up. With the rear seats folded it offers up to 1580 litres of load space. If the next Octavia Estate gets a similar increase in load space it's likely to provide more than 600 litres of space with the seats up and around 1700 litres with them folded. Skoda bosses told us that the new Octavia Estate will have the same wheelbase as the hatchback. It'll be slightly longer overall, but won't have a significantly increased rear overhang. A number of convenience features will be available for all new Octavia models, including a reversible load floor covering to deal with wet or muddy loads, boot fixing points and an ice scraper that clips into the fuel filler cap. Although Skoda has confirmed that four-wheel-drive versions of the new Octavia will be available, it hasn't decided whether these will be offered in the UK. It's possible that four-wheel drive will be reserved for Octavia Scout models, which will be based on the estate but have exterior body cladding and a raised ride height for a semi-SUV look. The new Octavia vRS hot hatch will be launched at around the same time as the estate model. It'll share many parts with the next VW Golf GTI and is expected to have a turbocharged 2.0-litre petrol engine that develops around 220bhp. As with the current car, the next vRS is likely to be available in both hatchback and estate forms. A diesel version is also possible.